Did you know that Celtic Spirituality is strongly linked to the Celtic Year, which was based on native Celtic trees? Each tree represented a quality that formed an intrinsic part of the whole. Each tree was allocated its time within the year and ascribed a rune called an Ogham. An important early lunar calendar came into being, forming an agricultural cycle based on seasons and lunar months,. This illustrative talk starts with a series of poems taken from Jackie Queally’s acclaimed first book Tree Murmurs ,and set to live music by Peter Aranos. 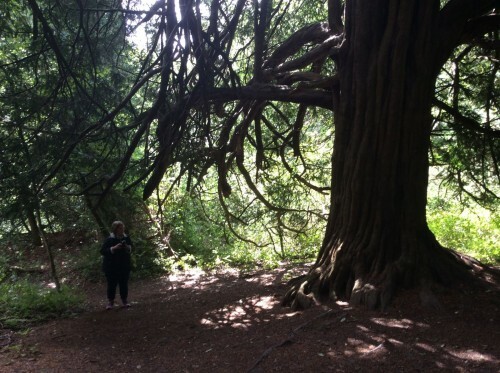 Jackie’s poems reflect how the indigenous “Celts” viewed their trees. The native trees all have different qualities, or devic energies, that were once perceived keenly by the Druids. Early sagas such as The Battle for the Trees which describe the tree alphabet the Ogham depict these qualities. Most of the trees in the native calendar represented a lunar month while some represent a season, of which there were five (there was a low and a high summer according to the harvesting). The dynamic patterns formed between the tree months are similar to patterns found in other cultures in other times, and the talk explains this interesting revelation. You may purchase beautiful tree meditations to help you assimilate this ancient knowledge.